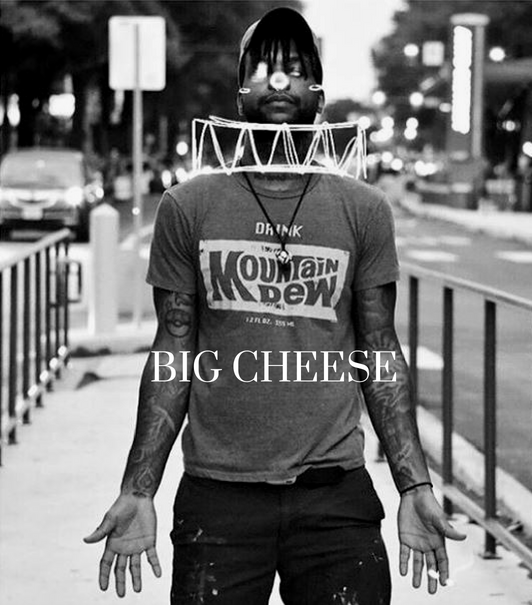 Big Cheese. A creator of music and art who has honed in on a theme of striking clown illustrations. His visuals and sounds have the feeling of a beautiful nightmare. Most importantly, I've found his overall purpose may be to explore deeper truths and be a source of enlightenment. His latest project, The Placebo, offers up a look into the possibilities of power the human mind has over its own self. The placebo effect is an important concept in my own studies and practices, as it explores the idea that we have the potential to implant reality based off of belief and state of mind. Big Cheese's music brings certain imagery to my mind that I would like to share, just as I did with The Impossible Gospel of Gypsy Jones. I'll write out the scene that sprung to life as I listened to his The Placebo EP. He looked over to the table to the right of where he sat. The plant, despite the darkness from being underground, thrived as long as it was fed a particular substance found up above. It was time to go get more. The television, an old black and white set he found when he first set up his space, played only one tape he watched on repeat. He paused the video and picked up the mask that protected his entire face from up above. He climbed the ladder built into the brick that exposed him to the first floor of the abandoned building. As he stepped out into the street, he absorbed the same sights as before. Nothing had changed. There were people scattered, sitting on the sides of the road wet from rain. It was a straight shot to the place that stored the substance he needed for his plant. It was the last living thing he had any personal connection to. He walked the path, passed the people who wouldn't stand. They sat soaked from the rain but turned their heads away as he continued forward. The sign atop his destination was not too far off in the distance. It gave off a bright neon red glow that flickered unpredictably in the night. He saw a man violently shivering and stopped in front of him. Barely threads were the clothes that showed the shape of the shivering man's ribs. He knelt down to examine the man further. Standing back up, he pulled the hoody off his body and up over his mask revealing a collection of tattoos that spread across his torso. He tried to hand the shivering man his hoody but was refused. As he turned to walk away, he threw it down near the man with a bit of force. Scrambling on the ground, the shivering man snatched the hoody and put it on. He reached the place that kept the substance. Just a few drops was all he needed to feed the plant for weeks. On the way back to his underground dwelling, something caught his eye on the ground. He bent down and picked it up. It would work perfectly with the others so he slid it in his pocket and continued home. Back down the ladder and into his space he stepped. A vast assortment of tools, gadgets, and miscellaneous items were illuminated by the gray glow from the TV screen. He administered the drops to his plant then gently touched it's blue leaves. Neatly folded in a basket on the floor were hoodies, shirts and other clothes. He grabbed a shirt and put it on as he went over to the shelf and picked up several items. Back to the chair he sat as he tinkered with a peculiar looking creation. On went the television and his one and only tape resumed. Out from his pocket came the thing he found earlier on the ground. It would work perfectly. Back to building. That concludes the visuals I concocted. I must say, I am deeply drawn to this project. The vocal style is so hauntingly perfect and unlike most things I normally listen to. I want more of this sound, of this expression. Folding in the recordings of people speaking about various aspects of the placebo effect pleases me greatly. Sound that serves a purpose, priceless.